Female dieters normally experience more difficulty in losing weight than male dieters. Thus, to tackle this issue, a new supplement has been introduced to the fat loss market named ApidexTrim. Claimed to be exclusively for female dieters, this supplement can apparently help to lower your hunger pangs, increase your metabolism, bolster your energy, and even reinvigorate your skin. Noticeable results are purported to be visible in just 14 days. With an array of marketing promises and 22 ingredients, ApidexTrim could seem to be rather unbelievable to female dieters who are grappling with fat loss. Let’s carry out a more in-depth examination of how the manufacturers advise you to take the supplement, and the supplement’s active ingredients, to see if purchasing it would represent a shrewd investment. Irvingia Gabonensis – (often called African Mango) has garnered considerable acclaim from customers for its’ fat loss results. 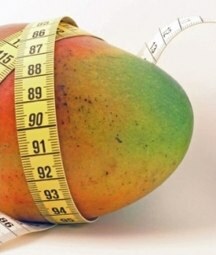 A two month study saw subjects, who consumed African Mango, averaging 28.1 pounds of weight loss, as opposed to subjects who consumed a placebo, where only 1.5 pounds, on average, was lost. It lowers hunger cravings, sheds fat, and stimulates the lowering of cholesterol. Satiereal – an extract of saffron spice which triggers the serotonergic receptors of the brain. This both lessens hunger pangs, and also produces an improvement in mood. Chromax – heightens the amount of chromium (the trace mineral) within the body, which moderates the body’s production of insulin. This lowers appetite, boosts lean muscle quantities, and enables you to reduce your consumption of calories by roughly 365 calories daily. Green Select – is a phytosome green tea mixture. This bolsters thermogenesis (fat loss) and increases your energy levels. Beauty Complex – blends alpha lipoic acid & collagen, alongside traditional components, within a proprietary concoction, which facilitates ApidexTrim’s marketing to female dieters. This blend smooths and replenishes the skin. The manufacturer says you should take a couple of tablets, twice daily, at an appropriate time. People who do this could expect the tablets to last for one month. 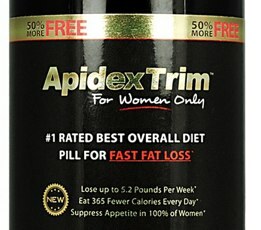 In view of the clinically-tested components that are included, and the extra attention given to the specific requirements of female dieters, ApidexTrim can be safely endorsed. Although a few of the supplement features (e.g. the Beauty Complex) could be deemed unnecessary, they are still a welcome addition that are rarely seen with fat loss tablets. A one month supply of the supplement retails for around £30.00 / $49.99 (in one bottle). You will get a reduced price if you purchase in larger quantities. By paying £90.00 / $149.99 for three ApidexTrim bottles, for example, you will receive three containers of their 72-hour tablets free of charge. 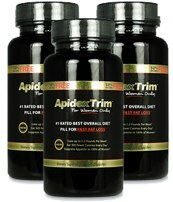 Each supplement has a 3 month, unlimited, refund policy, so dieters can test ApidexTrim with no financial risks.